You’re running an RPG to introduce new players to the RPG hobby this month. Which game and genre do you choose, and why? My answer might vary a bit depending on what the recuit players’ interests are. 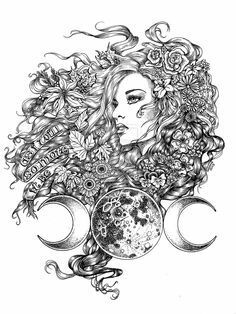 For example, I would try to tie in with a fiction world I know they already like, such as Harry Potter, the Marvel Universe, Star Wars, etc., which might affect the choice of system. As general introductory systems, I have had particularly good success for this using InSpectres (Memento Mori Theatricks), The Zorcerer of Zo (Atomic Sock Monkey Press), Fate Accelerated (Evil Hat Productions), etc. 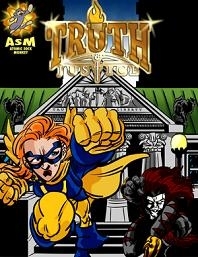 All else being equal, though, I would probably use Truth & Justice (Atomic Sock Monkey Press) again. I have had great success with completely new players taking on the persona of superheroes that might be complex to model in other systems, just jumping in and having great fun without the headaches. For example, I remember one forty-something who had never been in a role-playing game in his life, and decided he wanted to play Marvin Minsky with a body made of nanites. I just went along, and no, it didn’t break the game. He had a blast and said he would look into gaming in his hometown. The first phase game of signups for Big Bad Con 2017 opened at noon today. That means that everyone can register for two scheduled games, plus any number of quota-exempt events, usually the larger events. As is now customary when Big Bad Con opens the floodgate to game signups, the team was monitoring the server for response and signs of failure. Since its inception in 2011, Big Bad Con’s game offerings and attendance have increased steadily; in the early years, signup time became a sort of self-inflicted DDoS attack. Every year there is increased effort to do better and limit the chances of server failure as well as booking collisions, when extremely popular events become overbooked. This year I got a lodge seat to see the process handled by Big Bad Wolf Sean Nittner and Back-end/App Developer Jeremy Tidwell (Webmaster/Front-end Developer Colin Fahrion was on a plane at the time). They had secured extra computing power for the expected onslaught, and we had more registered guests than ever at this point. We contacted the victims of overbooking to apologize and let them know they could book something else, all within the first few minutes of signups. Next Saturday, September 23 at noon (Pacific time), everyone gets access to two more games in their quota. And in two weeks, on Saturday September 30 at noon, quotas will be lifted; in addition, games in the Teens room will now be accessible to all. The signups are rolled out gradually like this to give a chance to everyone to get into games that appeal to them, not just to the people who were available for a short and specific period. Jared Sorensen’s Parsely game catalog. So yesterday I spoke about our game of The Watch. This was our kickoff, where we got to create characters, clans, and even our great enemy, the Shadow, in its broad strokes. Edmund, Dani and I had all played in Bryanna’s playtest games last year but Fish was new to the setting. I felt much more relaxed about a friendly series set up for love of the game than I did about the playtest. I love playtesting and I try to give useful, constructive feedback, but I tend to tackle it as a more goal-oriented, must-meet-scope-and-deadline task than regular games. 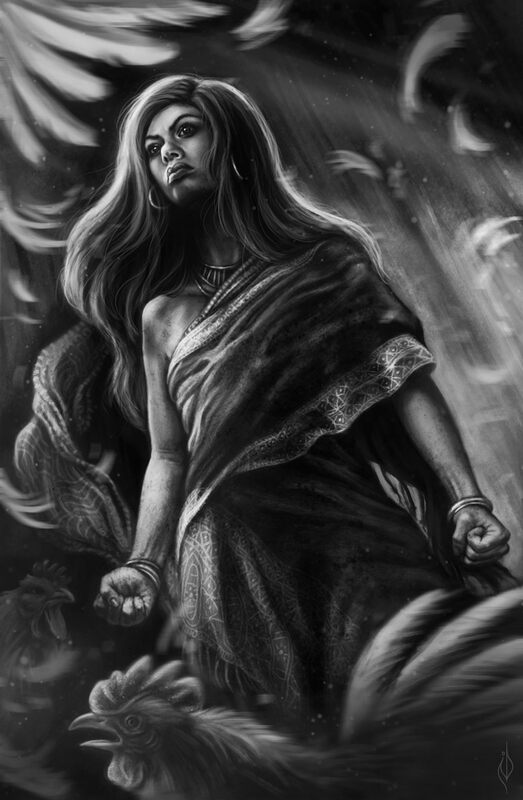 Yesterday I felt free to explore the setting and work on the detail of character relationships, unpressed by deadlines. Gaming via VoIP has its technological and emotional drawbacks, but it does let you assemble the most wonderful gaming groups that could not possibly meet face-to-face, and it allows the use of nifty tools in real time. For example, in our online games we usually prepare a Google Drive folder or other sharing point, and collectively take game notes during the game. Yesterday was no exception. You can also look for images of people, places, and objects right when they’re mentioned. Our GM Bryanna is very proficient with Roll20 and sets up great sites with backdrops, maps, character tokens, counters, card decks, etc. We opened with a discussion of everyone’s comfort level with varying levels of darkness, violence, etc., and the use of the X-card, followed by a brief tour of the game’s themes and tone, and the Roll20 tools. 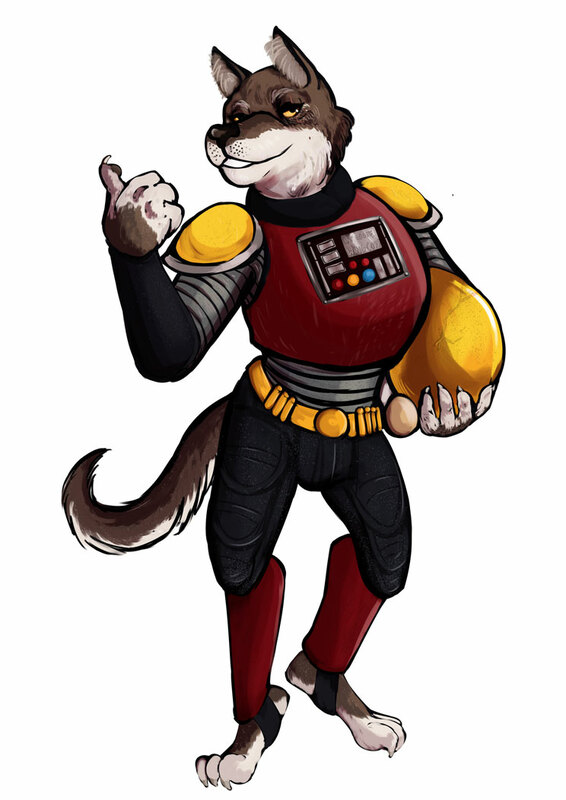 Teyka the Wolf; from Clan Molthas, known for their rugged mountain folk (me). We asked each other questions and established our characters’ relationships, generating a good deal of setting seeds in the process. 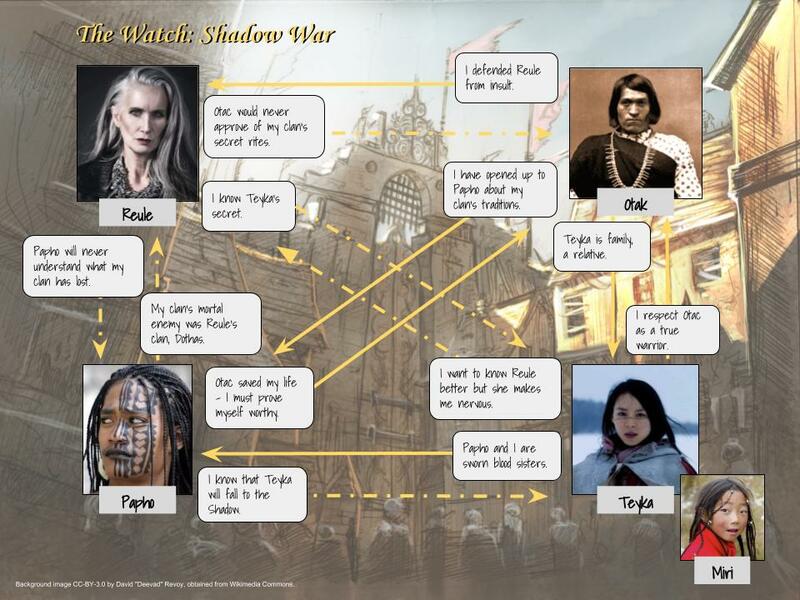 Here is a relationship map I made today on Google Draw with what we generated yesterday; there is actually much more detail in our campaign notes, but I like visual tools. Relationships can be edited on the fly. We then fleshed out our clans, and discovered more secrets, ties, and rifts! I think this is shaping up to be The Lord of the Rings + The Black Company + Fury Road. 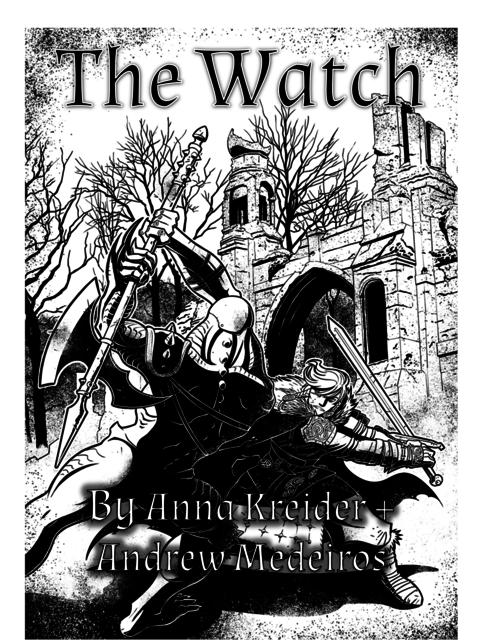 Credits: Cover of The Watch by Claudia Cangini. Relationship map’s background image CC-BY-3.0 by David “Deevad” Revoy, obtained from Wikimedia Commons. Picture of Otak is actually of Photo of We’wha, a Zuni Lhamana,CC-BY-3.0 Wikimedia Commons. Picture of Reule is actually model Nicola Griffin, demo’ing the Winter 2015 collection for Caterina Wills Jewelry. Picture of Papho is actually of a Hawaiian woman with face tattoos, Getty Images. Picture of Teyka is actually of actress Zhang Jingchu in “Jade Warrior,” 2006. Picture of Miri is actually of a Tibetan girl, copyright Adele Stoulilova 2010. No copyright challenge intended. Hey, it’s that time once again! 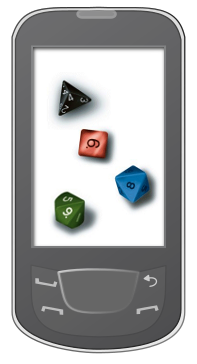 Thanks to an initiative launched by David Chapman, for the fourth year in a row August is #RPGaDay in the Google+ circles I follow and on Facebook. 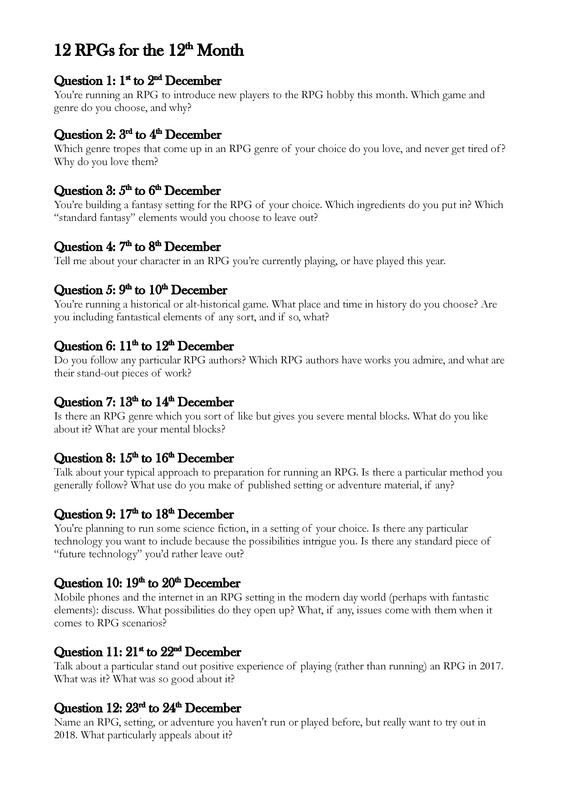 How it works: every day throughout August you get a writing prompt related to roleplaying games. It’s a good way to share what we love about our hobby rather than kvetching about geek world annoyances, and an encouragement to write more often for bloggers and authors who can use the practice. For me, the secret to completing this challenge is to write several entries in advance. On previous years I drafted them directly on Google+ (2014) or in WordPress (2015 and 2016). But this year I had an idea: since I was just talking about how useful Scrivener is, resulting in a number of questions on the software’s features and how to use it, I thought I would write my drafts in Scrivener. This will allow me to plan and compare entries more easily. More importantly, though, this will allow me to share this mini project. I set up a Scrivener project with 31 sections showing each day’s prompt, and I added the graphic version of the prompts and a list of useful links in the Research folder. A zipped version is located on Google Drive, feel free to use it. You can see I jotted down quick ideas onto the index cards; I could have removed them from the version I’m sharing, but I thought they would serve as examples of how I use Scrivener in planning my writing. 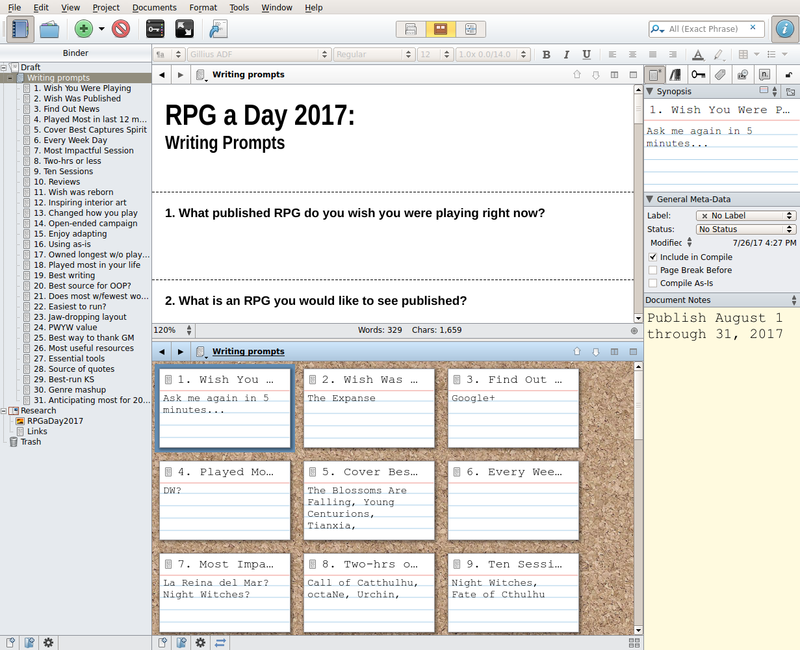 I hope this will encourage people to participate in #RPGaDay2017 and/or try Scrivener. I expect this little project will result in 6,000 to 12,000 words for me throughout August.